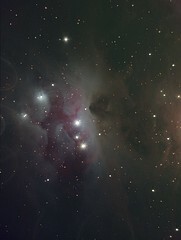 LRGB image of the often neglected companion of M42 The Great Orion Nebula. The Running Man nebula is a combination of an open cluster and reflection, emission and dark nebulae. I wanted to show the eerie faint red glow of the ionized hydrogen behind the bright reflective parts as well as the immense depths of darkness available in the vast nebulous region. The battle against reflections continues. I've been suffering from horrendous internal reflections, and after matting most of the inner surfaces I still have a serious problem with something reflecting to the edges, the current suspect is the inner surfaces of the filter rings. Time to go looking for a very dark matte black with an extremely fine pigment.